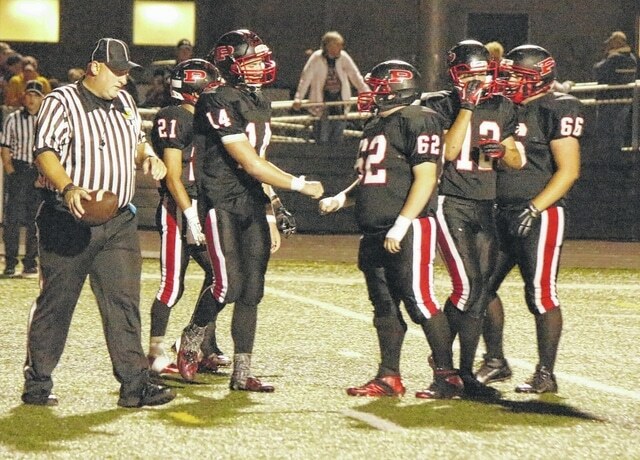 Point Pleasant junior Cody Mitchell (14) gives a fist bump to teammate Trenton Ramey (62) after scoring a touchdown during a Week 4 football contest against Logan at OVB Field in Point Pleasant, W.Va.
As the 2015 football season gets closer, the time has come to take a closer look at the football schedules in each county of Ohio Valley Publishing. Today, we will focus on the teams in Mason County. Despite having the tri-county’s only playoff teams in Point Pleasant and Wahama, Mason County still finished the 2014 gridiron season with a .500 record of 16-16. Point Pleasant went 9-0 in the regular season and finished the year 10-1 overall, while Wahama went 6-4 in the regular season and lost in the opening round of the playoffs. Hannan was the only Mason County team to go winless in 2014 with an 0-10 overall mark. The Big Blacks enter the year with West Virginia’s longest regular season winning streak, which currently sits at 23 consecutive games. Point Pleasant has made seven straight playoff appearances and also outscored opponents by a 471-52 overall margin during the 2014 regular season, which led to the program’s sixth straight unbeaten season. PPHS lost 15 seniors to graduation, but the Big Blacks still have plenty of firepower coming back for the 2015 campaign — including senior tailback Cody Mitchell, who recently gave a verbal commitment to Marshall University. The 2015 schedule is the same through the first nine weeks, but PPHS also has a 10th game on the schedule this year when it travels to Princeton Senior in Week 11. Point’s open date on the schedule is Week 10. Dave Darst will be entering his ninth season as head coach of the Point Pleasant football program. The White Falcons enter the season just two years removed from the program’s only state championship. Wahama has made six straight playoff appearances and also outscored opponents by a 288-253 overall margin during the 2014 regular season, which included a 6-2 mark and tie for second place in the TVC Hocking standings. WHS lost eight seniors to graduation, but the White Falcons return plenty of starters for the 2015 campaign. The 2015 schedule is entirely the same as it was a year ago. Wahama’s open date on the schedule is Week 10. Dave Barr will be entering his second full season as head coach of the Wahama football program. The Wildcats enter the year with Mason County’s longest regular season losing streak, which currently sits at 10 consecutive games. Hannan had to forfeit four games last year due to injuries and lack of numbers, and opponents outscored the Wildcats by a sizable 276-70 overall margin in 10 regular season contests last fall. HHS lost 14 seniors to graduation, but the Wildcats are expected to return 20 varsity players for the 2015 campaign. Half of Hannan’s 2015 schedule will be played against teams that were not on the schedule a year ago, which includes Jenkins Independent, West Union, Paden City and Bishop Donahue. Hannan currently has open dates on the schedule during Week 4, Week 7 and Week 11. Mike Wallace will be entering his fourth full season as head coach of the Hannan football program.